This article is about the current championship. For the original championship, see GFW Global Championship (2014–2017). TNA Wrestling (2008-05-20). Slammiversary 2007: King Of The Mountain. TNAWrestling at Youtube.com. สืบค้นเมื่อ 2009-07-14. TNA Wrestling (2007-05-17). TNA: The King Of The Mountain Match Is Announced. TNAWrestling at Youtube.com. สืบค้นเมื่อ 2009-07-14. ↑ 1.0 1.1 1.2 Caldwell, James (2007-05-18). "Caldwell's TNA Impact report 5/17: Angle-Rhino, Daniels-Raven, blood, Gore, and Stomper". PW Torch.com. สืบค้นเมื่อ 2009-05-20. The fans chanted for Christian and Angle said he is the new TNA champion. ↑ 2.0 2.1 Westcott, Brian; Oliver, Earl. "TNA World Heavyweight Title history". solie.org. สืบค้นเมื่อ 2009-05-20. ↑ "Current Champions List at TNAWrestling.com". Total Nonstop Action. TNA Wrestling.com. สืบค้นเมื่อ 2009-05-20. ↑ Total Nonstop Action. TNA Wrestling: Year One. TNA Home Video. 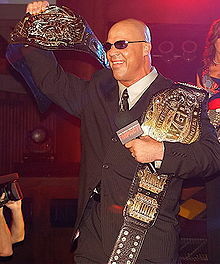 ↑ "NWA/Trobich strips TNA/Cage/Team 3D of NWA branded Championships". National Wrestling Alliance. สืบค้นเมื่อ 2009-05-20. ↑ Martin, Adam. "Full NWA-TNA pay per view results - 6/19/02". WrestleView.com. สืบค้นเมื่อ 2009-06-12. ↑ Martin, Adam (2007-05-13). "Complete match order for tonight's TNA Sacrifice PPV in Orlando, Florida". WrestleView.com. สืบค้นเมื่อ 2009-07-08.